FRHI Hotels & Resorts is planning a major repositioning and renovation of the Hotel Rey Juan Carlos I hotel in Barcelona, which has become part of the Fairmont portfolio. Jennifer Fox, president, FRHI International and Fairmont Brand, said that meetings regarding the redesign are due to take place imminently, after the group announced an agreement to manage the hotel earlier this month. "We only just signed the deal a couple of weeks ago but we are getting a team of architects and designers together to look at what needs doing. "All the rooms will be refurbished and the lobby needs to have a huge rethink. We'll also look at reworking F&B and plan to create a Fairmont Gold Lounge, but the convention centre and spa are already amazing." The renovation will take place in 2015 and will remain open throughout. 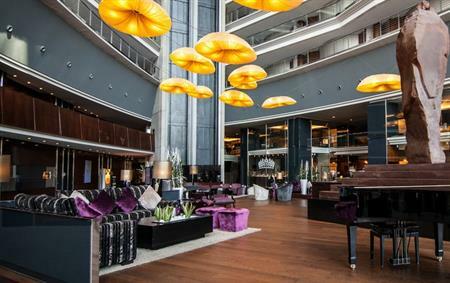 The 432-room property occupies a prime location on Barcelona's Avenida Diagonal. The hotel was designed by architect Carlos Ferrater and inaugurated by the King and Queen shortly before the Barcelona Olympic Games in 1992. The launch of Fairmont Rey Juan Carlos I is part of FRHI's aggressive expansion plans for it's three brands – Fairmont, Raffles and Swissotel – that will see it grow from 113 to 170 properties over the next four years.